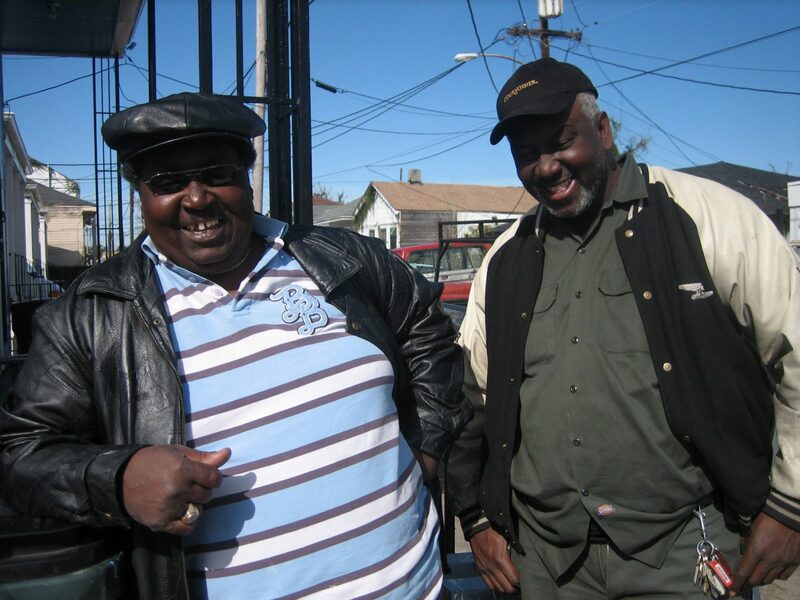 URBANbuild’s relationship with the community is a significant aspect of the program. Every January, a group of students is welcomed by Central City neighbors who have watched the construction of prior URBANbuild projects and look forward to seeing the new design. Introducing new, progressive, well-made projects into a struggling neighborhood helps community members to see progress. Neighbors form relationships with the students, and help watch over the job site. 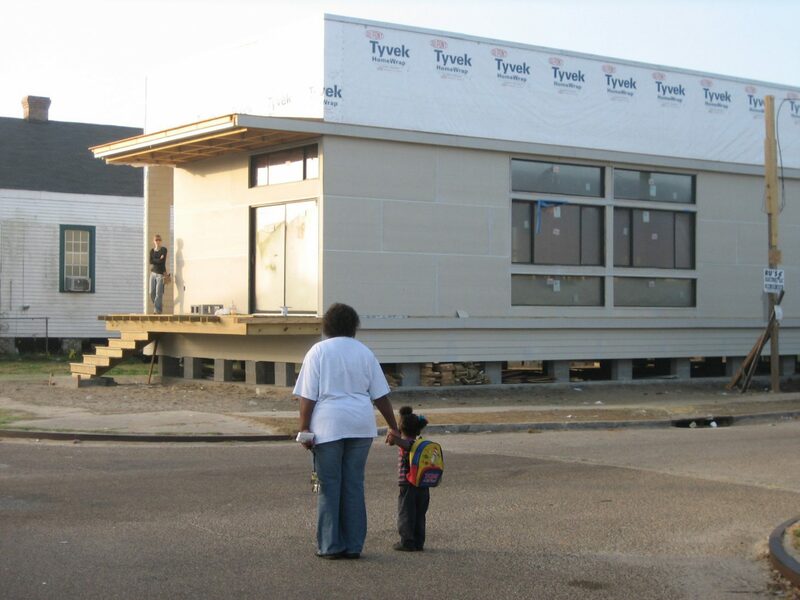 URBANbuild has worked with Neighborhood Housing Services of New Orleans (NHS) for many years to connect with the community and eventual homebuyers. Each year, NHS donates an empty lot for students and faculty to develop. These lots are acquired through the city’s adjudicated property program. Collecting various lots within close proximity aids NHS in realizing its mission of working with the city on the revitalization of communities and neighborhoods. During the design phase, NHS presents the needs and values of the community to students. In some years, NHS also coordinated introductory meetings between students and representatives of the community. NHS works with students on design development through participation in student design reviews. During construction, NHS maintains involvement and authorizes the disbursement of funds. The organization serves as a liaison between university and neighborhood communities and representatives. Finally, NHS locates interested buyers for completed homes and offers instructional classes in an effort to assist potential buyers with loan and subsidy qualification, application, management, and accounting. New Orleans’ urban fabric possesses many unique qualities. In New Orleans, struggling neighborhoods often exist adjacent to thriving ones. Some blocks are characterized by examples of historically significant housing types that have succumbed to blight. Older neighborhood blocks are pedestrian-friendly, with limited off-street parking. Most older homes have a front porch or stoop that is often occupied as a stage for neighborly observation and conversation. Urban blocks in New Orleans are typically home to a higher percentage of renters than homeowners. URBANbuild has worked to transform one neighborhood in particular. In the first 12 years of the program, 10 projects have been sited throughout the Central City neighborhood of New Orleans. While the houses are in close proximity to each other, they are rarely side by side. These new homes are fabricated using common and readily available materials and methods in a fresh way. With an aim of preserving qualities of street life and domesticity, they often borrow and reconsider common physical components and qualities of the familiar local building types, such as scale, size and pattern of windows, relationship to a garden, relationship to the street, and the importance of a front porch or stoop. These new, progressive homes bring new home buyers and investment to the neighborhood. As the number of homeowners increases, greater care is taken in the maintenance of the community’s public spaces, and a sense of shared investment surfaces. The history of the URBANbuild program proves that old and new structures can exist side by side, allowing us to address the often blurred distinction between preservation and replication. It is rewarding to see, after working for over a decade in one neighborhood, change and improvement happening in Central City. During the spring semester, students often form meaningful bonds with community residents. URBANbuild 10 students developed a special bond with young boys in the neighborhood who were fascinated by the construction. By the end of the semester, one of them decided he wanted to be an architect when he grew up. Neighbors often shout encouragement as they walk, bike, or drive by. In the ultimate endorsement, some indicate their interest in buying URBANbuild houses while they are still under construction.